Happy September! I just got home from a nice long visit to the Pacific Northwest, where (unlike here in humid Baltimore), a slight chill in the air can only mean one thing: summer is coming to an end. For me, it’s back to the grind at work, and for the kiddos, it’s back to school. 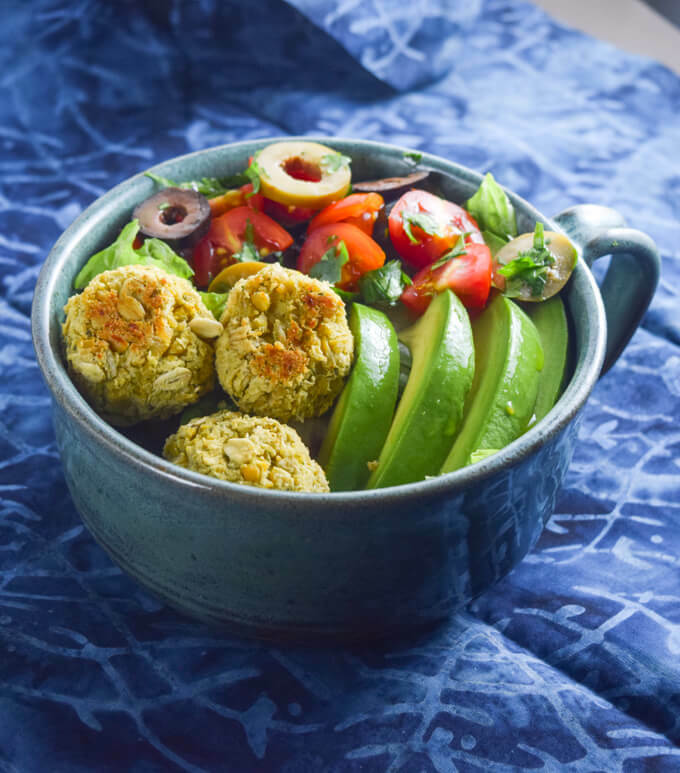 ‘Tis the season of packed lunches, so I wanted to share this falafel salad bowl recipe today. The baked falafel that I crumbled into my salad are easy; portable; versatile; and healthy. Not to mention, falafel was always one of the few things that my picky school-aged self actually liked to eat. I’ve mentioned my love of oatmeal before, but oats are for more than just cookies and porridge! They are an incredibly versatile whole grain and can be equally handy in savory applications. I particularly like to quick oats as a binder in baked falafel. 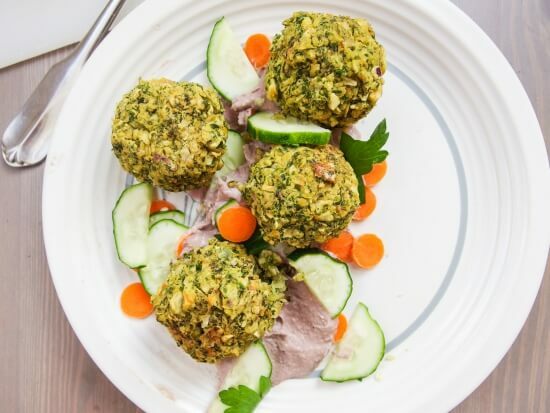 In addition to adding fiber and whole grains to the dish, they are a great shortcut to creating nicely-textured baked falafel. Some falafel recipes call for soaked, dried chickpeas and for adding breadcrumbs or flour (I’ve actually used oat flour to this end before in my kale falafel). Quick oats negate the need for either of those by both adding texture and absorbing excess liquid. So when Bob’s Red Mill asked me to share a recipe using their oats, I immediately knew what to do. 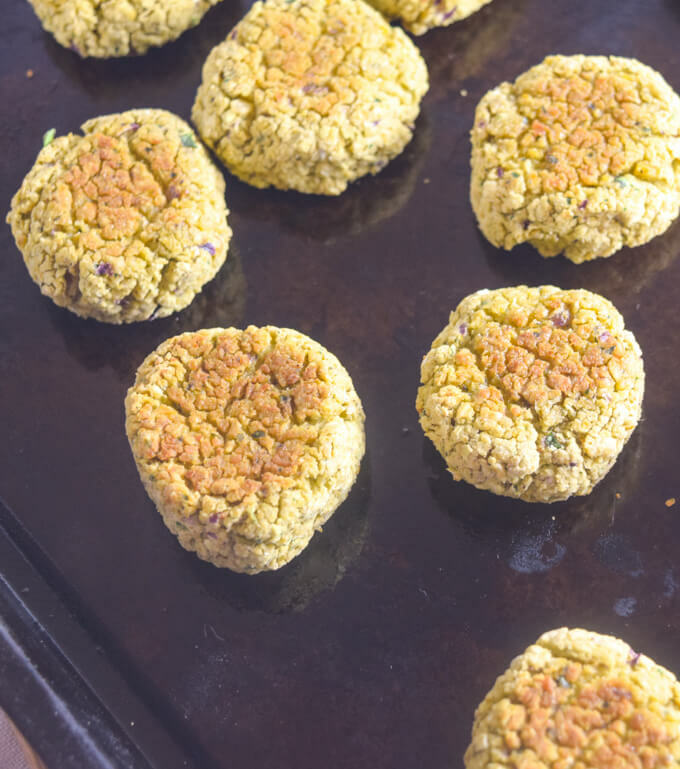 This is my latest go-to baked falafel recipe – I made it 4 times in the process of preparing this post. 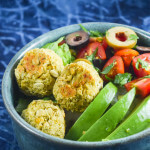 Because the baked falafel already comprises a bean and a grain, I especially like it atop a salad full of fresh veggies. This sundried tomato tahini sauce is great for dressing greens and the sweet and tangy flavor pairs well with the falafel. But you can just as easily serve the falafel with any fixings of your choice. Put them in a pita pocket, pair them with yellow rice, or do what I did the other day and make a fusion falafel wrap with guacamole, roasted potatoes, and peppers. Depending on the accompaniments I have planned, I also love changing up the mixture of spices that I season this recipe with; a pinch of garam masala is especially nice! A freshly-made batch of this baked falafel should keep for a week in refrigerator (sorry – I haven’t tried freezing it), and it tastes good at room temperature. Between that and the infinite possible serving suggestions, it’s a great option for packing in a lunchbox along with your kids’ favorite accompaniments. Enjoy! P.S. Bob’s Red Mill is offering a variety of free coupons right now on their website, which are good for both oats and other Bob’s Red Mill products. 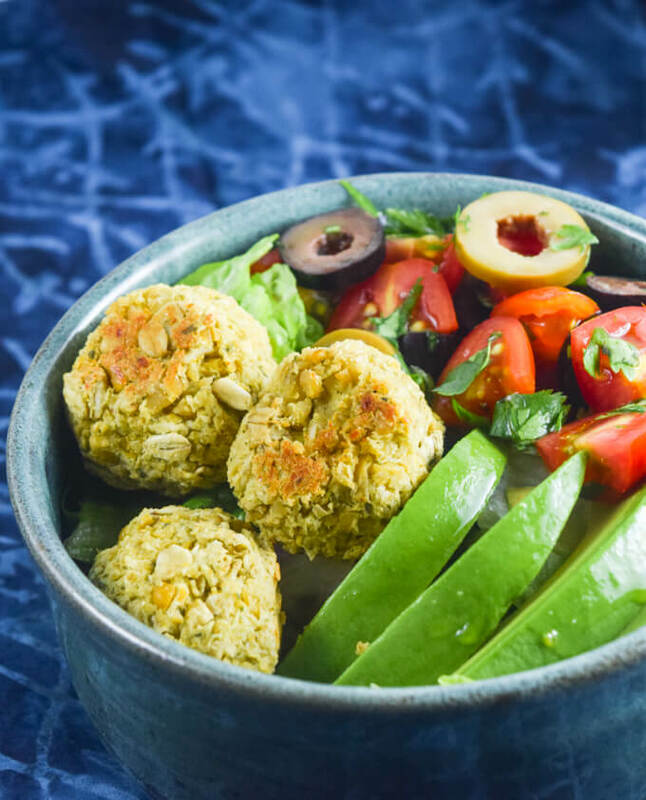 Simple baked falafel are crumbled over a bed of vegetables, avocado, olives and greens, and served with a sundried tomato tahini dressing for a hearty lunch bowl. Preheat the oven to 375 degrees Fahrenheit. Lightly grease a baking sheet with olive oil. In a food processor, combine the onion, garlic, tahini, olive oil, cilantro, cumin, salt and pepper. Blend until fairly smooth, stopping to scrape down the sides if needed. 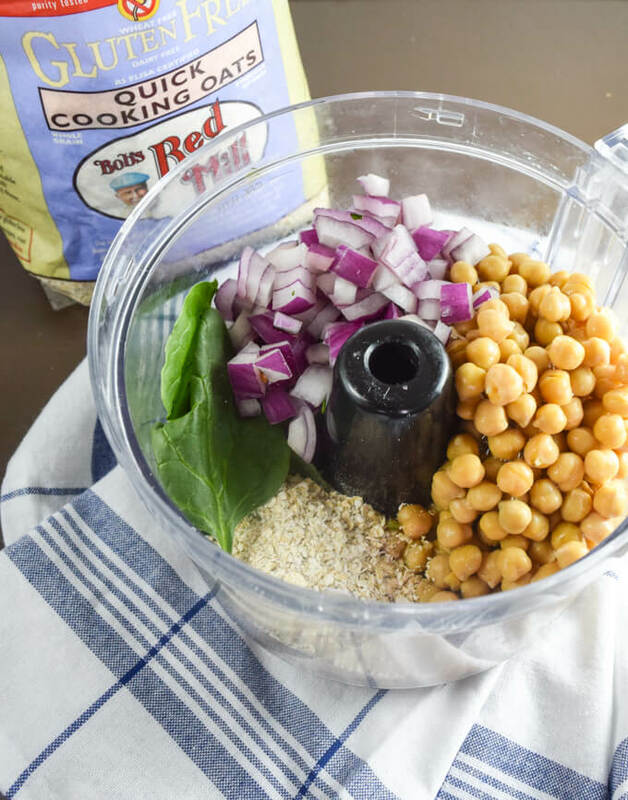 Add the cooked chickpeas and 1/3 cup of oats to the food processor. Pulse a little bit at a time, until the chickpeas and oats are broken up into small chunks and incorporated, but not smooth. Transfer the mixture to a bowl. Stir in more quick oats as needed to get the mixture dry and thick enough to roll into balls. One by one, roll the falafel mix into small balls and place on the greased baking sheet. Optionally, you can flatten it into more of a disk shape if that better suits the way you'll be using the baked falafel. Bake for 15 minutes without opening the oven door. Take the pan out of the oven. Try to be very careful here; the baked falafel is still quite delicate at this stage. 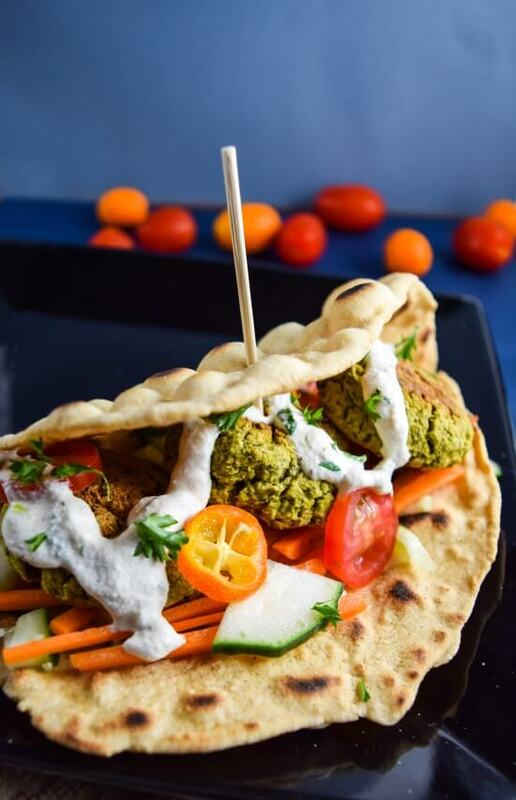 Use a spatula to dislodge each falafel ball from the baking sheet and flip it onto its other side. It's important to use a spatula and move the falafel from the bottom using a sideways motion. If you pull upward on it, it's likely that part of it will stay stuck to the baking sheet. Return the baking sheet to the oven and cook for about 15 minutes more, or until lightly browned on both sides and slightly crisp on the outside (but still soft on the inside). If you keep baking it longer after this, it will get even crunchier, but also more crumbly. Once cooled, baked falafel will store in an airtight container in the fridge for about a week. 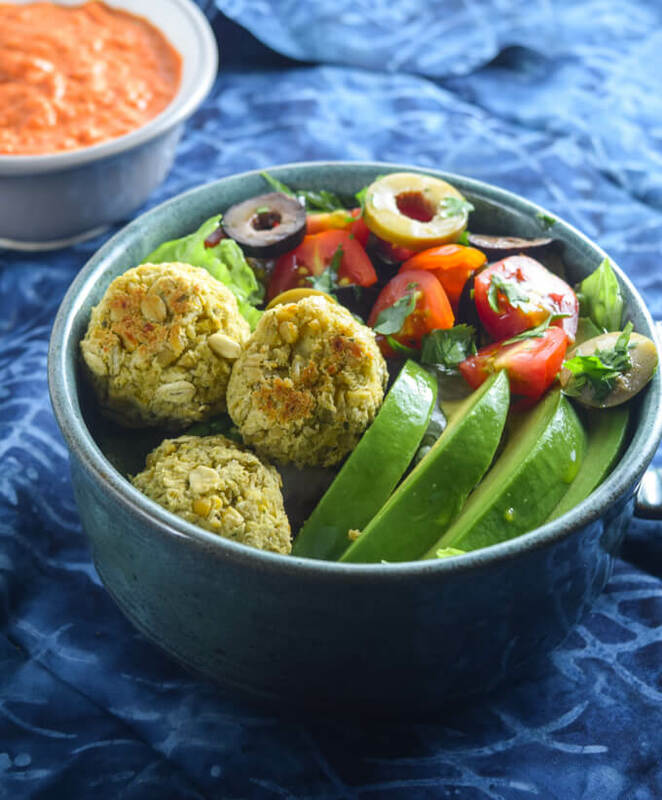 Toss together all salad ingredients except the falafel with your sauce/dressing of choice. For my sauce, I used tahini blended with sundried tomatoes and a little maple syrup. Your favorite tahini-based dressing, vegan tzatziki, or Italian dressing would all work very well here. I recommend that you don't substitute old-fashioned rolled oats for the quick oats here. I have tested it both ways and the rolled oats work, but don't integrate as well into the falafel after cooking. Nutrition information is calculated for the falafel only and excluding the salad accompaniments. Love Falafels! What a great recipe :)) Thanks for sharing!